At home with the flue. Gives me lots of time to contribute on various forums. I had a conversation with Jon' earlier this morning and I promised him pics of my military (military-ish?) watches. Having said that, I ran into some questions about two watches (later more about them). First my diver's divers... Spirotechnique. An Auricoste MN issued, a real military watch. Doxa Spirotechnique followed the same route and then... Vostock. I think the Sovjets paid close attention to the diver's logo on dials and must have thought: we can do better (i.e. larger). This Vostock Amphian runs like a quartz watch. And there's a real Sovjet bracelet on the watch: cheap, noisy but rugged. Lada-esque. And now the questions. 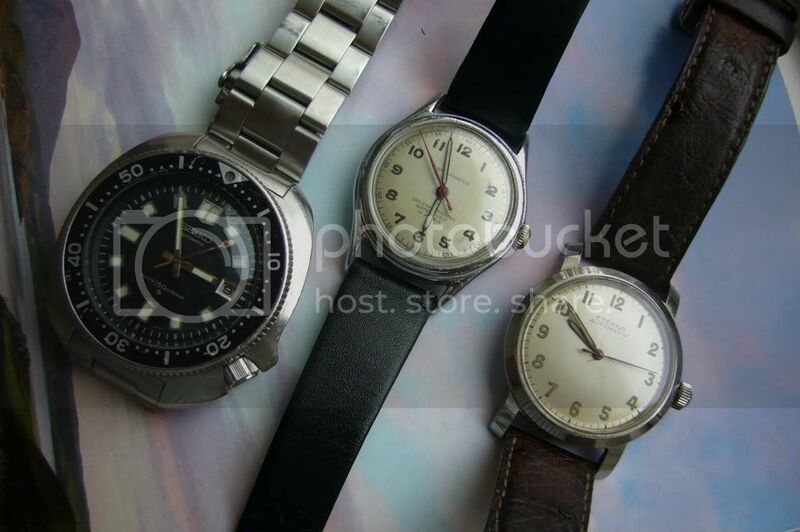 Below is a pic of three watches. The well known Seiko 6105. No doubt about the military history of this type of watch. It's a fully original one with a Yobokies super oyster. The original waffle is in the drawer. But... the other two watches are far more interesting to me. My father owned both watches (together with a Blancpain FF Aqualung - he lost that one sailing the North Sea...). I don't know anything about the Eterna: not it's age and I don't know nothing about the way it came into my father's drawers. If I recall it correctly, it must have been his watch from the mid 60s I think. The watch in the middle without a name on the dial (only 'antimagnetic' and 'shockprotected - waterproof - 17 jewels) is the most interesting of them all. On the back is only 'Swiss made' and a number: 3804. As far as I remember, my dad had that watch as his daily wearer. He always told me that this watch was issued by British troops when he joined them early 1945 and before he was sent to Melacca (Maleysia) and the Dutch Indies (Indonesia) in 1946. 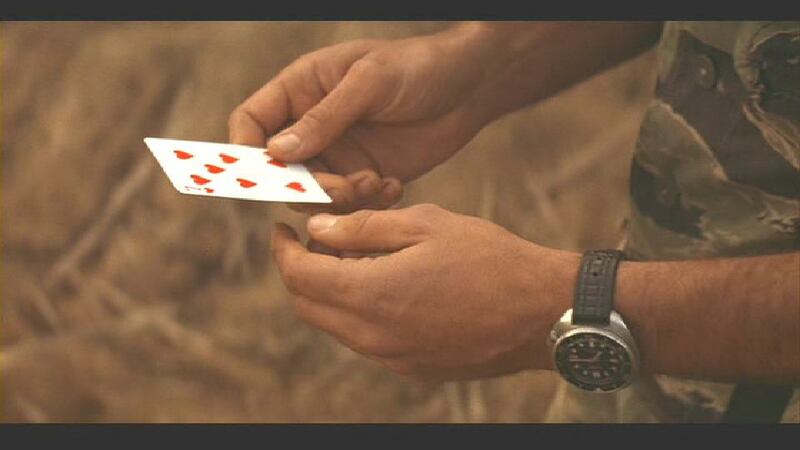 However, the watch has no broad arrow / crow's foot. 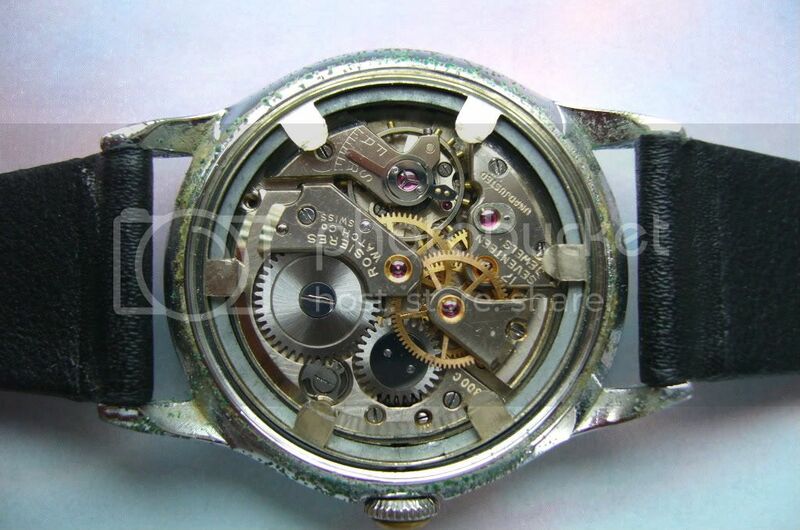 I own lots of pics of my father in battle dress (British battle gear) wearing this watch. He served between 1945 and 1950. I've added a pic of the m/ment of the watch. The only clue I get is 'Rosieres'. Afaik, Rosieres was an American watch company. I'm really looking forward to your comments and suggestions! Thanks, Menno. 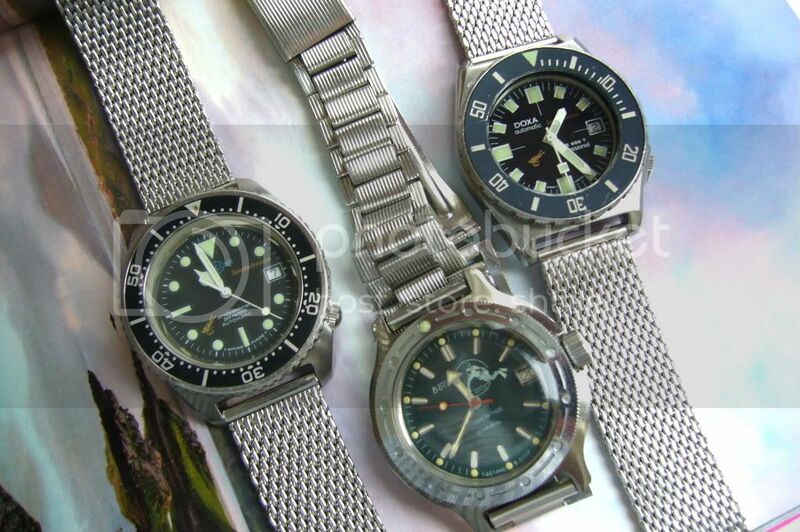 Didn't know you had a Vostok "Scuba dude" - like you say, they are tough old things which seem to last for days on a full wind and are extremely accurate. I can't quite tell from the photo but if that's a black dial version it's quite sought after and rare. It's a bargain too for a 200m watch. Great MN Auricoste - I gather that these outnumbered all other MN watches by 2 to 1 towards the end of their service life - guess all the MN divers wanted to be Jacques Cousteau? Can't recall if those Doxas were ever issued but no doubt more than a few of them were purchased privately by MN divers. The watch with the Rosieres movement reminded me a bit of those German Stowas which were taken by the French as war reparations and used in the Indochina war in '54. I'll have a look through my sources to see what I can find. Could you tell us a bit more about the Seiko 6105 in military use please? (Wasn't that the one Martin Sheen wore in "Apocalypse Now"? [which no-one has mentioned in the "Good war film" thread!]). My Vostock has a metallic blue dial. I bought the watch last your from a guy on a national Dutch watch forum. I paid about 12 GBP for that watch. As said, it goes and goes. Somehow, I like it: it looks flimsy, but it gets it's job done! The crown looks like the crown of a 'canteen watch': the crown is pushed over a thread sticking out of the case and then screwed down. Brilliantly simple! It would be fun to know about the Rosieres (well, let's call it that way). I know that watch as long as live. It was serviced every three year by a local watchmaker back in Rotterdam where we lived and I bought my father a nylon strap for his watches every year on his birthday. I've been trying to scan some old pics of my father in battledress, fighting in Asia. For now, it's unsuccesful; I can not get proper images from these old b/w photos. My 6105 is the later version of the one Sheen was wearing in Apocalypse Now. The first 6105-8000 version was slimmer than the later 6105-8010 version. 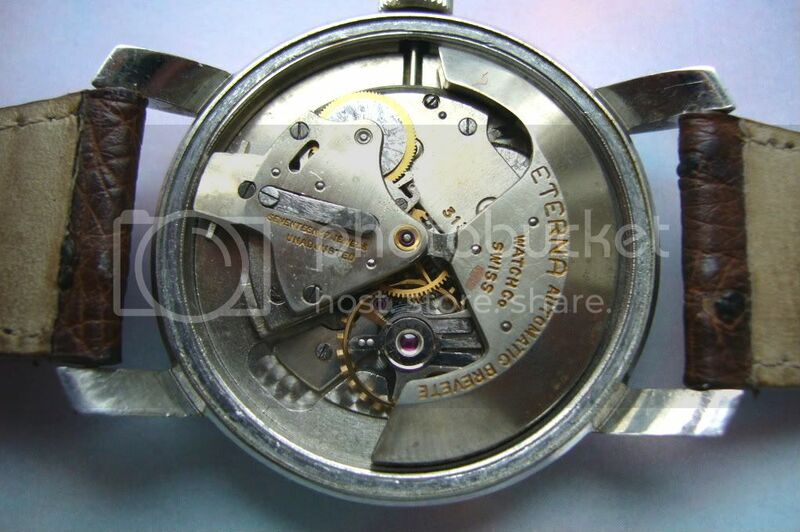 There are also detailled differences on the dials of the older ones. 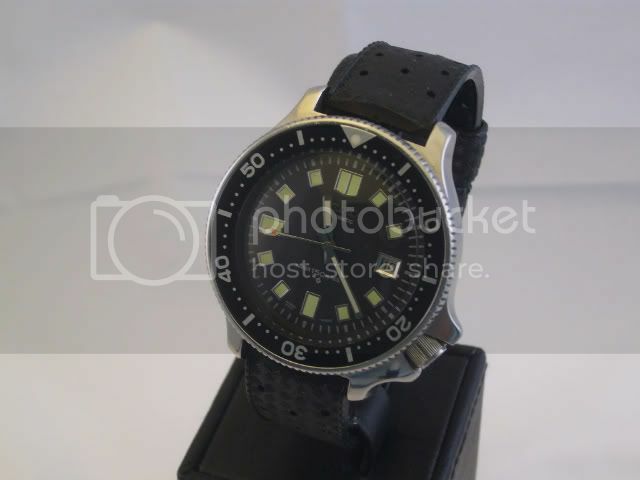 Some stating 'waterproof' later versions had 'waterresist' on the dial.